Frustrated end-users complain that they don’t get the reports that they need on time, the reports are out of date or contain errors. Administrators lack centralized control over access to report data and report destinations. Users continue to request on-demand reporting capabilities for mobile devices. Increasing demand for new reports or variants requires incremental staffing, which may not be an option. Users simply want more control – they want updated business intelligence available at their convenience, not yours. You need to provide a self-service reporting solution for end-users, partners and customers that enables on-demand access to business intelligence assets and unmatched ease-of-use on any computing device. And such a solution must operate within constraints defined by enterprise security policies. A web browser on any computing device is all you need to obtain updated reports in seconds. There’s no need to contact anyone or wait for a scheduled delivery. Business intelligence is on tap 24×7. The reporting portal hides application and data complexity from end-users, so training is minimal or unnecessary. At the same time, the web-based portal maintains a high degree of flexibility by offering runtime parameters selected by end-users. Populating those parameters dynamically from external data sources is an option for supporting dependencies across systems. The KISS principle governs the user interface, easy to learn, easy to use. Reports are displayed on screen, but the user can download it to a PC or mobile device. PDF, Excel and CSV downloads are supported. Microsoft Active Directory integration adds to a sophisticated permissions framework to limit who can see what. The framework scales without constraints to support any number of internal users, partners, and customers. Meets all modern IT standards and is fully compliant with requirements defined by HIPAA, SOX and conventions in major industries, such as healthcare or financial services. Create and combine report variations with runtime parameters (default, menu-driven, external source-driven) to customize information for every end-user or for groups of users. Report instances and their variants are automatically refreshed after changes, thus saving considerable time and effort. Deleting and re-adding reports individually is not required. The interface can be rebranded easily to conform to any company standards. Deeper integration with other solutions is offered through a robust API that allows it to be embedded seamlessly. Real-time business intelligence dashboards & KPI dashboard software is in very high demand. 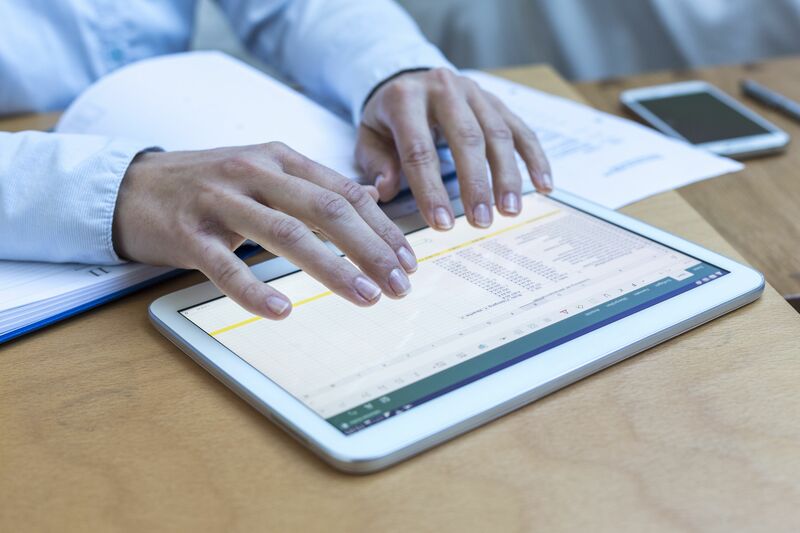 Technological advances enable them to supplant more traditional forms of reporting, which in turn makes them useful for solving an extraordinary number of business challenges. But they are particularly important for organizations to use a systemic approach to enterprise management because it requires real-time process monitoring and rigorous use of key performance indicators. For some end-users, scheduled and on-demand reports aren’t enough. They want real-time views of their world with easy-to-digest data visualizations that allow drill-downs to underlying details. End-users want those up-to-the-moment views to be available on any platform, including mobile devices. Dashboard tools embedded in popular business applications are often too complex or require too much training. End-users don’t want to be involved with creating the solution – they just want the result. Resources to work on dashboards may be unavailable; an incremental headcount may be very difficult to justify. 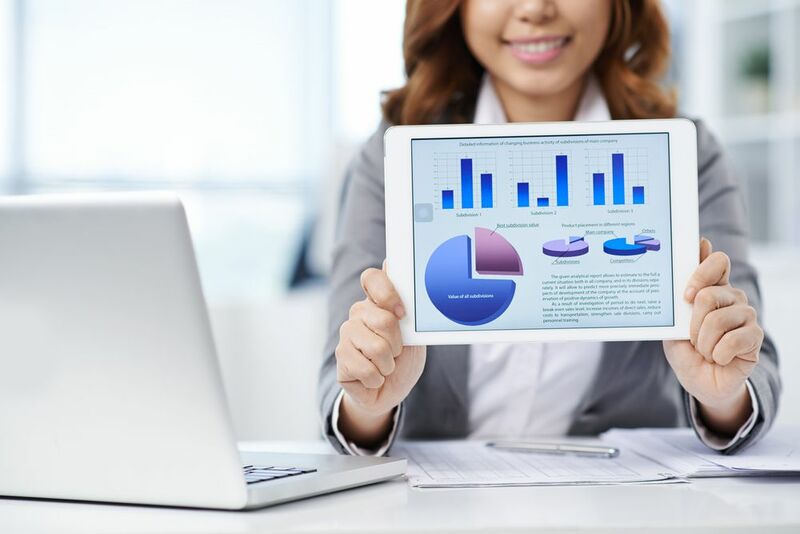 Self-service BI & KPI dashboard software allow users to get to the right numbers, to identify trends and then drill down into the details to get to the root causes of problems or to isolate specific opportunities. Choosing the right technologies and, if needed, reliable external consulting partners is critical when responding to this need. Client-side interactive visualizations include heat maps, gauges, geographic maps, waterfall charts, and other advanced visualizations; interactive data tables with in-cell graphics; and grouped, cross-tab reports with drill-down and drill-through. Fully supports mobile devices by offering optimized web pages for small screens. This includes support for a full range of touch interactions. Filter data by entering a date range or selecting a category from a drop-down box. Click on summary values to drill down to the transaction details behind that summary. Show multiple KPIs on multiple tabs in the same application screen.Move from one to another with a click or a tap. Make multiple decisions at a glance. Dashboards are visual and intuitive. No training required. Deployment and scaling of dashboard solutions are easy on industry-standard platforms. Our product is agnostic with respect to hosting infrastructures (e.g., on premise, remote data center or cloud services such as Amazon Web Services and Microsoft Azure). Fine-grained user access control across every layer of a dashboard application, including charts, application functions, columns and rows. Single sign-on integration with popular security frameworks or homegrown applications (LDAP, Windows Active Directory, or custom databases that store user profiles) is offered. Server-side passing of credentials from custom applications for embedded use cases is also supported. The most useful BI dashboards are usually a single view of data sourced from multiple applications, databases or files. Connections, extractions and integrations across sources do not require constructing intermediate warehouses or complex data models. Everything developers need is available out of the box. As an IT executive, you’ll recognize the following report distribution challenges that are difficult to manage in a resource-constrained environment. Frustrated end-users complain that they don’t get the reports that they need on time, or the reports are out of date or contain errors. You don’t have a central mechanism to manage and distribute reports generated by dozens or hundreds of discrete applications. IT analysts spend too much time outside of normal business hours triggering period reports, maintaining scripts and fixing batch files. The IT organization spends too much time at month-end or quarter-end fixing problems with application interfaces and process breakdowns caused by human errors. You’ve been asked to drastically scale up your reporting infrastructure to support the extended enterprise: partners, suppliers, and customers, yet you can’t scale your headcount proportionally. 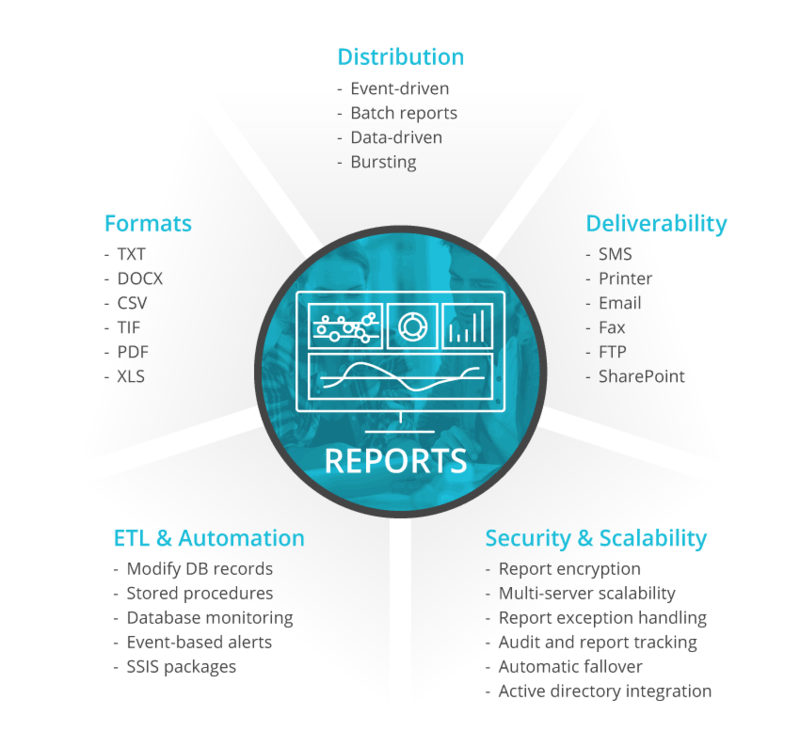 You need a single, enterprise-wide solution that addresses all report distribution needs. You may already use one or more report writers (e.g. Crystal Reports, SQL Server Reporting Services) in your company. You don’t want to replace them—you simply want incremental capabilities to address the distribution management gaps. You need an automated report scheduling and distribution solution that can handle the unique complexities of your business, is easy to manage, is robust and can simply be set and forgotten. Unparalleled flexibility to define fixed, dynamic, data-driven, bursting and event-driven schedules for individual reports or groups of reports. Combine these dimensions to match your business requirements precisely. Because change is constant, the administrative interface facilitates easy alterations. Use any and all means to deliver reports: email, print, fax, FTP, SharePoint, DropBox, ODBC and SMS, to name a few. Destinations can be inside or outside your company. Export to dozens of formats including doc, docx, xls, xlsx, pdf, txt, tif, csv and many more. Create, update and delete database records. Create, copy, merge, modify and move files. Upload or download items to FTP. Trigger other actions based on pre-defined schedules or criteria. Built-in security module, together with Active Directory integration means you will meets all modern IT standards and be compliant with requirements defined by HIPAA, SOX and conventions in major industries. Audit Trail records all access and changes to the system. The solution is agnostic with respect to the architecture of its operating environment. It doesn’t care if you use virtual machines, distributed instances, load balancing or anything else. It just works.